I made this bag for my mom a couple of weeks ago. I LURVE it! Honestly, I was thiiiiis close to deciding to keep it for myself. Even my sister, who was delivering it to my mom in person, said she might "accidentally forget" that she was supposed to give it to mom. 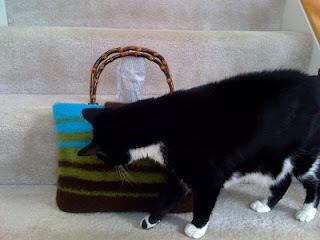 Even little Whisk loved this bag....then again, she basically loves anything that I crochet. She's the best fan in the entire world. Anyway, happy birthday mom. I may just have to duplicate this bag because, quite honestly, I think it could be pretty marketable. It will be named the Hilda bag, just for you. Nice work, on all of them! I am picky about stripes, and really like yours! would youn be adverse to telling me the color names/numbers u used in this bag for mom? I mean, I can see that is a GOR-JES shade of blue, and looks to be olive green;not sure about the 3rd color, tho it looks dark brown to me. I crochet too, knit-needles and round looms, make lampwork beads, sew and other assorted fun things. AND I have 7 house cats. Plus a minimum of 8 and up stray/ferals I feed.and try to get fixed!!! they hand out our address on the street, I am sure of it!!! Good Luck to U, keep up the good work, I love what u have done. Hi Bonnie! Thanks for stopping by! I'm so glad you like my mom's purse- it sure has been a crowd pleaser. 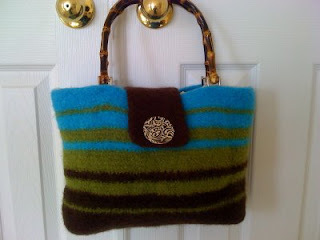 :) I used Paton's Classic Merino Wool in Too Teal, Leaf Green, and Chestnut for this bag. My mom's favorite color is green and she has a thing for turquoise...I thought that this eal was close enough, so voila! You sure sound like an awesomely busy crafy person...and anyone who is a cat lover is cool in my books. :) I hope you stop by again soon!